PromosUSB Technologies utilizes the PANTONE MATCHING SYSTEM® for printing all color and multi-color orders. Many larger organizations and most professional graphic artists utilize this system. It is important that we receive the PMS colors due the different ways that the same colors can be rendered. What you see on a computer screen (which is comprised of red, green, and blue dots) is often slightly different then how it would look printed on a plastic or metal USB flash drive. This would include mock ups that we may provide to show your artwork on one of our flash drive models. Whenever possible we recommend that you choose imprint colors from the Pantone Color guide. All printed colors must be 100% opacity and fill. Sometimes it is impossible to choose a Pantone (PMS) color for any number of reasons. You may have lost this information, never had it , or you only need to print text. Black and white does not require color matching. If color matching is not critical for your project, we have a simple solution. ust choose from one of the standard colors below that are utilized by our printers. Please note the disclaimer at the bottom of the color chart. In short, there could be differences in what you see on your screen versus the printed color on the custom printed USB flash drive. These colors do not match up with any particular PMS color. Standard colors can only be used for RUSH orders that are printed in the US. Our standard quotes are based upon offshore production. 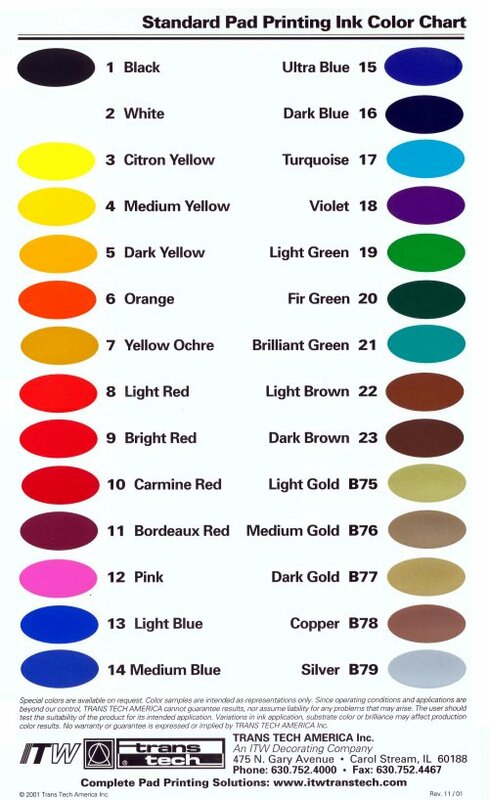 For Pantone colors, please consult our PMS color chart. If you have any questions, please consult your Account Executive.